Preheat oven to 350. Place the hens in a roasting pan with a rack. Place 2 onion wedges (or just one wedge if the cavity is especially small) and a lime wedge in cavity of both hens. Roast for 30 minutes. Meanwhile, in a small bowl, whisk together the preserves, zest and juice. If the glaze is too thick to easily spread (it shouldn't be, but some brands of preserves are thicker than others), heat it briefly over low heat. Remove the hens from the oven. Brush each with the glaze, leaving about 1/2 of the glaze for later. Roast an additional 15 minutes then glaze again, using up all of the remaining glaze. Roast an additional 15 minutes or until the hens are cooked through. Remove onion and lime wedges from inside the hens and serve. Cornish Game Hens debuted in the US market in 1965. While their name is slightly misleading, the Rock Cornish Game Hen is a specially breed variety of teeny-tiny chicken. While they are not currently in vogue, they are fun to eat-they are small enough to serve as individual portions-and frequently on sale. A local store had them for just 99 cents a pound and since cornish game hens weigh and average of 1 1/4 lbs, they make for a pretty cheap but fancy-looking meal. They fit perfectly not only on my minature silver platter but as the main course for our '60s night. 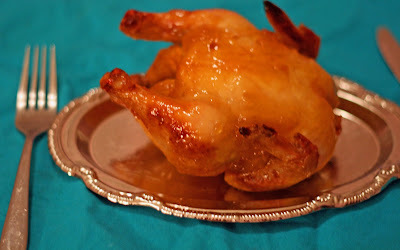 Now, I am not 100% sure that a ginger-lime glaze is exactly a classic '60s way to serve game hens but a perusal of some cookbooks of the era show a lot of glazed meats featuring apricot preserves so I came up with this variation using my favorite ginger glaze and some lime to keep it from becoming too sweet. The result was quite tasty, the flavors of the preserves and the lime juice seeped through the thin skin and flavored the entire bird. I served it with a classic iceberg lettuce salad made with lettuce wedges, blue cheese dressing and crumbled bacon pieces for that '60s era company food charm. Quick note: I deliberately gave the above photographs that orange-y look that is so prevalent in '60s era cookbooks, the actual food comes out of the oven looking much less day-glo.